Beef, brown sugar, soy sauce, vinegar, liquid smoke, garlic, spices. The first flavors I pick up are a light sweet and smoky, along with some garlic, and something comparable to thyme, coriander, or perhaps celery. The chewing brings on a flavor reminiscent of BBQ sauce, and some additional sweet. I can feel a light heat building up. The natural meat flavors come in towards latter part of chewing, tasting like steak cooked well done. For being advertised as "Legendary BBQ", and described as starting off sweet and ending with a kick, I'd say that it holds up. It does have an overall BBQ-like taste, but more like something that was seared over a really hot grill, where some of the sauce blackens and crusts. It has a smoky character, and definitely starts off sweet and brings in a spicy kick later on. That spicy kick rates on my personal heat scale as "mild medium" (level 2 out of 5). Otherwise, the primary taste profile is a sweet barbecue sauce flavor, lightly spicy, lightly smoky, not necessarily tangy, or tomatoey, but certainly well seasoned. It's not over-the-top sweet, nor is it gooey, but it has a grilled, or a "charred" flavor. The meat consistency is that of thick slabs of round cut across the grain. I see some fat and gristle, but I don't feel them in the chewing. I wouldn't call this "moist" as the company says, it's more on the dry side. It definitely is chewy, however. 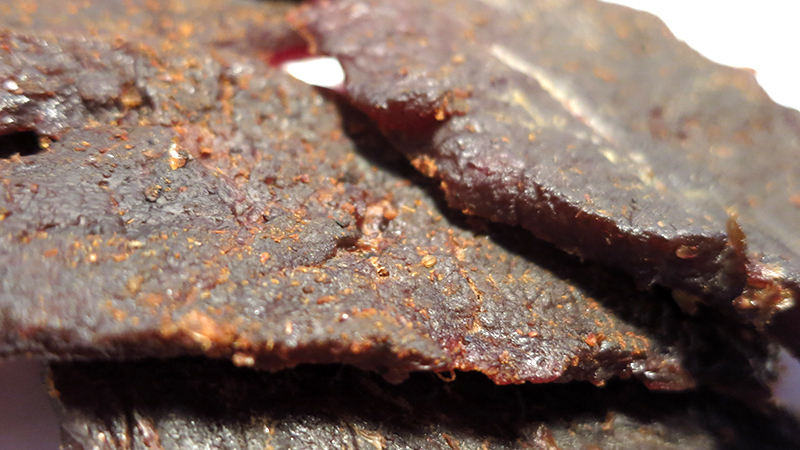 Overall, it's still easy to chew, and takes on a meaty, steak-like chewing texture. 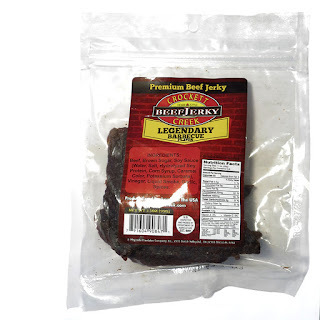 This Legendary Barbecue beef jerky from Crockett Creek manages to deliver on a barbecue sauce flavor, with a little of that flame-grilled, charred and smoky character, to effect a bit of realism in the overall taste. The barbecue flavorings are not heavy, and actually seem somewhat light, perhaps allowing the natural meat flavors to be noticed. While I felt this jerky is overall good, and quite snackable, it still didn't "wow" with its barbecue sauce. I'm sure Crockett Creek's barbecue sauce is indeed, "Legendary", but I've tried many more brands whose sauce is more tangy, lively, and bold. 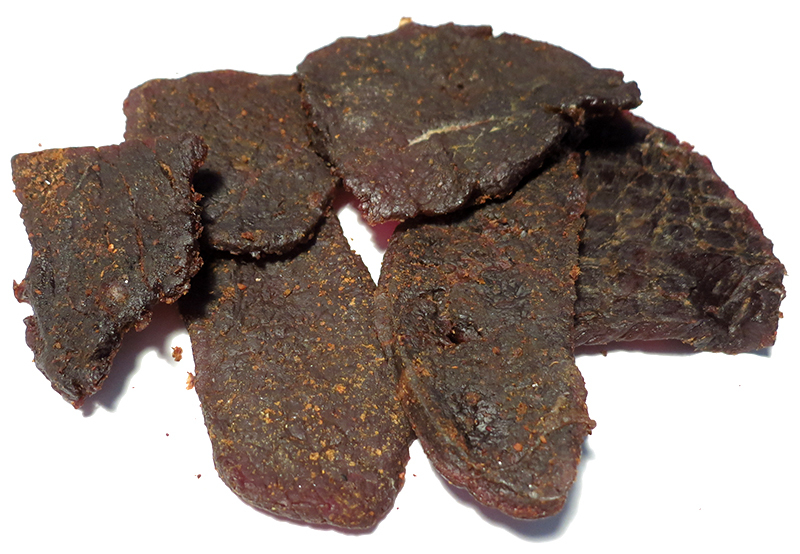 Crockett Creek, does however, score points with its thick sliced slabs, and meaty, steak-like chewing.